The Salamander Chronicles is an amazing new book of poetry by Don Beukes including a forward by Scott Thomas Outlar. This brilliant blitz of unsuspecting rhyme will have your head spinning. Also the content will have you simultaneously weeping and cheering. This is by a man who experienced Apartheid and has one of the most unique perspectives of any living contemporary poet. READ THIS BOOK! Don Beukes has managed to capture the raw essence of trust, wonder, struggles found in a society we live in. His book had me on a journey with every page turned into a world of marvelous beauty and excitement. I recommend his book to all who love poetry and truly heartfelt reading. of feigned reality and tells you what people wish they could gain the courage to tell you. I will talk about a few of my favorites. The poems that struck me the most were thinly veiled calls to action for poets and writers to confront the corruption of power in all forms. As a fellow word-weaver, these select poems inspired me. I was left stunned by the gravitational pull of Beukes’ words. First, before I say anything else, let me just say that this book is one of the most beautiful things I’ve ever seen. It has a gorgeous, smooth texture with a cream-coloured back cover and is very sturdy and, honestly, it just feels nice to hold. It’s the most beautiful book on my shelf. Not to judge a book by its cover . . . luckily, the contents are even more excellent. My favourite thing about this book may be its mission statement. Don Beukes writes in the dedication, “I hope my words will inspire all of you to share your experiences despite cultural or religious constraints to remain silent and invisible,” and in the preface, “Allow yourself to regain your confidence in life, despite the circumstances we all go through.” This could not resonate with me any more, and with all of us, and Beukes’ poems certainly back up his words. The short poem ‘Love Generation’ ends with “We don’t choose / who to love or care for – It’s your / darkened heart we pray for – / Allow yourself to breathe / then free yourself to love . . .” And love this ending I do. Reading it feels like a breath is drawn in and then released as the ellipsis fades away. This sense of catharsis is a major theme throughout The Salamander Chronicles as Beukes dips inside of us and points out the goodness that lives inside, and the power of it. There are also very personal poems, such as ‘Echoes of You,’ which opens with the tender and honest “It took me a while to write to you / I feel like such a fool,” beginning what is a beautiful and heartbreaking ode to a ghost of the past. The poems in The Salamander Chronicles positively shimmer and sparkle, held together with clever use of em dashes and a frequent sense of rhyme that never failed to catch me off guard. The result is a gorgeous book of highly musical, intensely passionate and, ultimately, absolutely inspiring poems that will help you find the inner strength you always had. I greatly look forward to Beukes’ next book. 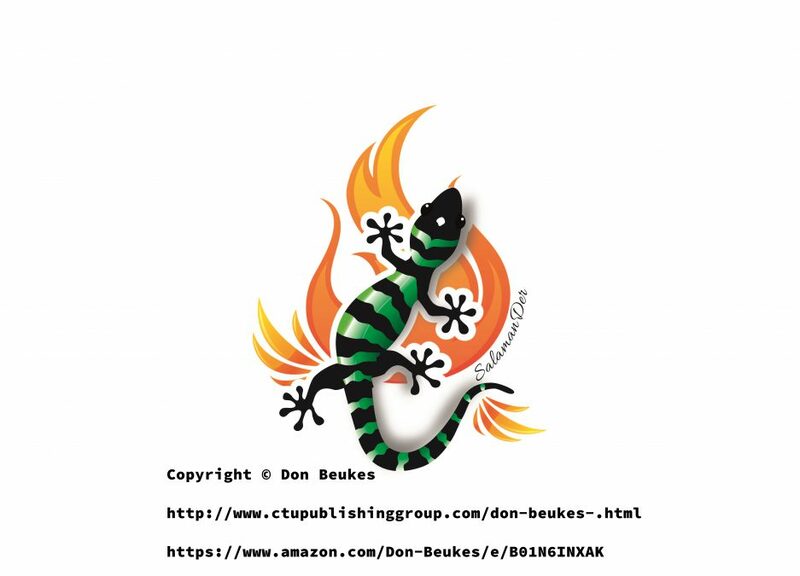 The Salamander Chronicles by Don Beukes is a collection of poems that would appeal most to an audience of adults who enjoy poetry; though some mature young adults might also enjoy the collection. The Salamander Chronicles comprises many different poems that all have their own themes. The themes range from oppression, bullying, politics, globalism, sexism, abuse, birth, death, all the way to refugees. The Salamander Chronicles is clearly written by both a talented and passionate poet. The first thing about The Salamander Chronicles that pulled me in was the beautifully done cover; I felt like the cover gave me a snapshot into the type of environment that the poems would be taking me. An aspect of these poems that made them enjoyable to me is that Don Beukes uses fast paced rhythms; this gives the poems a fast moving feel, which served to draw me in deeper and deeper. I liked the fact that the poems drew on Don Beukes’ personal experiences from when he lived in South Africa. While I found most of the poems to be both interesting and moving, my favorite was, by far, Emergence. I recently lost my grandfather so when I read this poem I felt that not only could I understand its message, but also that its message was something I could seek to apply in my own life. Overall, I found the poems to be moving and insightful. I feel inspired by them and I am so very glad that I got the chance to read them.